VICTRON 4000Kw (inverter & charger) with remote mobile phone App for monitoring the batteries. Linssen are renowned for their quality construction and this is a well looked after example. All windows have sun reflective glass, with secondary glazing inside in polycarbonate material. Aft cabin with double berth on starboard (130x190) and single berth on port side (95x190) headroom is 1.75m. hatch and port holes with mosquito net. Interior in honey colour wood and wood parquet floor throughout. Forward peak with round dinette convertible in a huge oval double berth (170x170) and headroom of 1.65m. Saloon with interior helm and a good headroom of 2m completed with a huge opening hatch. Galley with 3 burner gaz cooker (2 propane bottles stored in the foredeck locker), a Panasonic microwave combined with oven and grill. New 12V/220V fridge and a freezer (stored below the table). Lots of cupboards and storage, one of them holding a 3.5Kg washing machine. Opposite the galley, shower, Jabsco manual heads connected to a 250L holding tank and basin, electric extractor. hoover, fenders, sun screens with zips for summer for all windows. Exterior helm with corresponding nav. instruments bow thruster control, instruments cover. Bimini stored in a bag in winter, removable davits stored. All the walking area on deck has been repainted in 2018 with non slip International paint. 4 steel mooring pins & hammer, warps for winter (1x20mm) and summer (6x16mm Marlow braid cruising ropes. 4 balloon fenders for the bow and smaller for the hull. Circular teak table and 2 matching chairs. swimming platform and stainless ladder, cold & hot shower. 2X40L fuel cans, hose to refill. Rudder indicator, speed, compass, fuel, battery and water gauges. VHF radio. 2 life jackets, 4 fire extinguishers, fire blanket in galley. 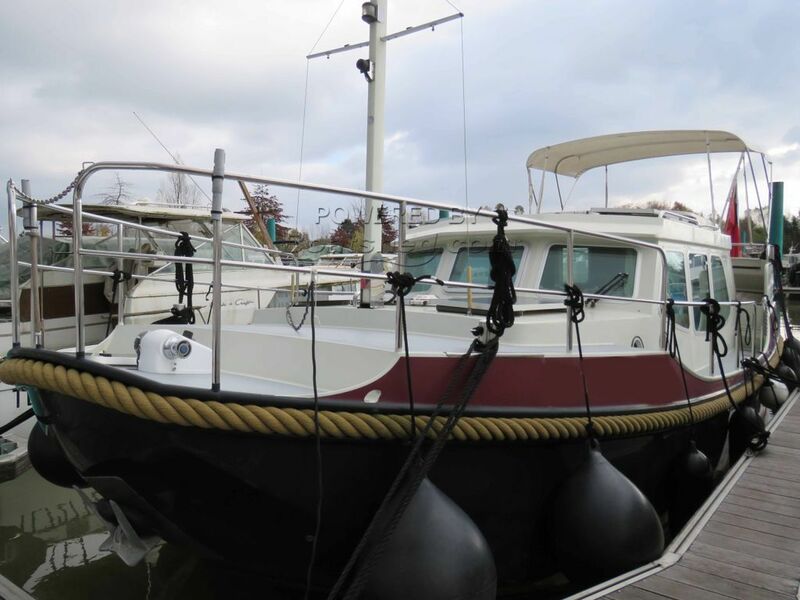 Linssen Dutch steel cruiser for sale in France. Boatshed Bourgogne is pleased to offer this LINSSEN STURDY 320 AC for sale in South of Burgundy, moored in a quiet town marina on the Saone river, with all the commodities. This well maintained cruiser has been on the hands of our lady owner since 2005 and she is only the second owner. She has used her as a live aboard and cruised most of the French waterways during the last 13 years. Regularly and lovingly maintained our vendor is retiring from cruising but is still very active in proudly maintaining her boat. A great cruiser for the inland waterways and coastal navigation, this boat will also be ideal as a live aboard for a couple. Mooring could be transferrable by request, and will be ideal as it is central most of the inland waterways routes. For more information or organise a viewing, please contact Magali, your local broker at Boatshed Bourgogne. This Linssen 320 AC DUTCH STURDY Live Aboard has been personally photographed and viewed by magali WHARMBY of Boatshed Bourgogne. Click here for contact details.